The “COCOON” Convective Patient Warming System includes Micro processor controlled CWS 4000 warming machine and a full range of Cocoon Warming Blankets to suit various applications in patient care for maintaining patient temperature (Normothermia). The development of the micro pore blanket system for the delivery of air gives a constant air flow, thereby providing a uniform distribution of warm filtered air across the patient. The universal inlet port ties ensure a secure hose connection to the blanket, enabling our blankets to deliver a warm soothing cocooning effect to your patients. 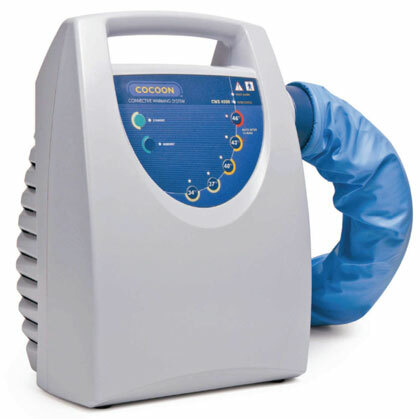 The Cocoon CWS 4000 is light and compact and has been developed to be user-friendly for both Health Clinicians and for Biomedical Engineers. We take care to exceed essential regulatory standards.